Team Slipstream took off fairly early today, edging CSC's leading lap times as they rode. They were amazingly smooth and disciplined, quietly storming around the course. When Levi Leipheimer and Chris Horner's Astana squad took the course, they quickly outpaced Slipstream's time on Laps 1 and 2 of the Road Atlanta race course, and it looked like we might have a new best time of the day, but a slow third lap left Astana 3 seconds short of the Argyle Army. Last to leave the start house was George Hincapie and race leader Greg Henderson's Team High Road. Again, their early laps set the standard, but they faded late, charging to the line 5.2 seconds slower than Team Slipstream. High Road's Greg Henderson holds the lead by virtue of a few bonus seconds earned on the road, but Slipstream's got a strong quartet sitting at 15 seconds -- Tom Danielson, Trent Lowe, Christian Vande Velde and David Zabriskie. CSC was 4th on the day at 12.72 seconds, Toyota-United 5th at 23.43. One team that has to be disappointed is Rock Racing, 10th at 52.35. If one of Rock's riders is going to contend, they'll have to climb over a lot of bodies to get there. More, and many more photos, tonight. Tom Danielson's illness will keep him out of the Tour de France this year. 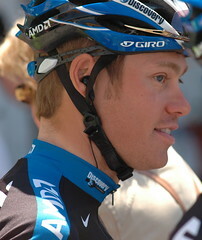 Danielson, 29, won the 2005 Tour de Georgia, and led Discovery Channel at the 2006 Vuelta, where he won Stage 17, and was 6th overall. He was expected to make his first Tour start this season. Bruyneel suggested Danielson would likely race the Vuelta a España, where he won a stage last year and twice finished in the top 10. Depending on the speed of his recovery, he could also race the Tour of Austria (which he won last year) as well as the Tour of Quinghai Lake (which he won in 2002) in China, where the team will be going for the first time. Discovery Channel's Tom Danielson exited the Dauphiné Libéré yesterday, complaining of stomach problems. Danielson was expected to make his first Tour de France start next month, but missed the Tour of Catalonia with a stomach virus and now will miss the Dauphiné's climbs. Gerolsteiner's Heinrich Haussler won Stage 1, and looks to be a lock for Gerolsteiner's Tour squad. Also dropping out was former world champion Igor Astarloa of Team Milram, suffering from toxoplasmosis. VeloNews reports Astarloa requires two weeks of rest, and will not start the Tour. I am going to hate missing the Tour of California. With the obvious exception of Floyd Landis, fans will get to see pretty much every American racing in the ProTour, and many of the world's best riders will be racing in the US for the first time. The race, kicking off Sunday, will feature the winners of 4 stages and the prologue of the 2006 Tour de France: Thor Hushovd, who took the prologue and Stage 21, CSC's Jens Voigt, Stage 13, Michael (Spider) Rasmussen, who dominated the Alpine climbs and won Stage 16 and the king of the mountains, and Matteo Tosatto, who won Stage 18. You want Americans? They got 'em: George Hincapie, Levi Leipheimer, Tom Danielson, and Jason McCartney from Discovery Channel; Dave Zabriskie, Bobby Julich, and Christian Vandevelde from Team CSC; Freddie Rodriguez and Chris Horner from Predictor-Lotto; Aaron Olson, now with T-Mobile; and of course the US-based Pro Continental and Continental teams, mostly populated by US riders. You want ProTour royalty? They got 'em: World champion Paolo Bettini, world time-trial champion Fabian Cancellara, reigning Giro champion Ivan Basso, and former world TT champion Michael Rogers. There are also lots of old faces on new teams, as with Michael Barry, Greg Henderson and Jakob Piil, all now with T-Mobile, Juan-José Haedo, dominant in US sprints last year, and now racing for CSC, and Henk Vogels, now racing for the Continental Toyota-United squad. Also, injured Credit Agricole rider Saul Raisin, whose recovery continues, plans to ride each stage noncompetitively and visit with fans at the start and finish. He's also promoting a ride March 31st in Dalton, Ga. called Raisin Hope. Should be a heck of a race. The Discovery Channel team will spend at least some of its 2007 season seeking a new title sponsor, after a management shakeup at the network, according to Sal Ruibal at USA Today. With Monday's departure of Discovery Network president Billy Campbell, a longtime supporter of the team, the network decided not to extend a 3-year contract that started in the 2005 season. That's when Lance Armstrong won his 7th consecutive Tour de France. The team was previously sponsored by the U.S. Postal Service, which left the sport after negative publicity about the cost of its team sponsorship. With US national champion George Hincapie, defending Giro champion Ivan Basso, Levi Leipheimer, Yaroslav Popovych, and Tom Danielson, Tailwind Sports general manager Bill Stapleton should be well positioned to find a replacement sponsor. On the other hand, the team has traditionally been sponsored by U.S. companies, which may be less likely to sponsor the team with Armstrong out of competition. The sport's continuous doping scandals may also discourage sponsors. Basso the new boss at Discovery? Eurosport quotes from La Gazzetta dello Sport (in Italian) that Ivan Basso might jump ship to Discovery Channel in the off-season. CSC director Bjarne Riis says that's just one of those crazy Tour rumors, and that he is “still regularly in contact” with Basso. The deal might make sense for Discovery Channel if the team has decided it needs to compete for the Tour victory every year to satisfy its sponsors; Yaroslav Popovych is a possible future Tour winner, but probably 2-3 years from being a race favorite, and Tom Danielson is unproven in longer stage races. Basso is still training, and says he wants to ride in September's Vuelta. I realized last night that the webisodes available on the Race2Replace website are one or two full episodes ahead of those posted on the iTunes Music Store. That means that if you're subscribed to the iTMS podcast feed, you're currently 2 very interesting webisodes behind. The first, “Johan the Great,” is a profile of Discovery's DS, Johan Bruyneel. The 2nd, “The Showdown at Brasstown,” provides some more fodder for the debate about the Danielson/Floyd Landis showdown on Brasstown Bald. In it, Bruyneel repeatedly reins in Tom Danielson, pinning him to Landis's wheel like a misbehaving pup. He tries to get Danielson to feign weakness, then makes him save it all for a last-k attack, which, of course, didn't crack Landis. The production quality on these is terrific, and they provide some fairly intimate background on the riders. Hincapie's wife and rehab featured prominently in a recent episode, while McCartney's desperate need for a bathroom during Stage 2 of the TdG features in the latest. One interesting exclusion is any discussion of the cause of Hincapie's crash at Paris-Roubaix; if this was your first exposure to it, you might think he just flopped off his bike on the slippery cobbles. Discovery Channel's Tom Danielson didn't take the start this morning at Stage 20 of the Giro d'Italia. Team director Johan Bruyneel said Danielson has been suffering from sinusitis, and that his fever worsened overnight. Danielson had hoped for a top 10 finish, but was sitting in 16th after yesterday's stage. "He has combination of time-trailing and climbing that you need to be a contender in major tours, but only time will tell whether he's a guy who can go for the top five, the podium or the win in major tours," Bruyneel said. "He finished in the top ten in his first full major tour and that was really good to see, but we're not going to raise our expectations too high either. We have to be realistic." 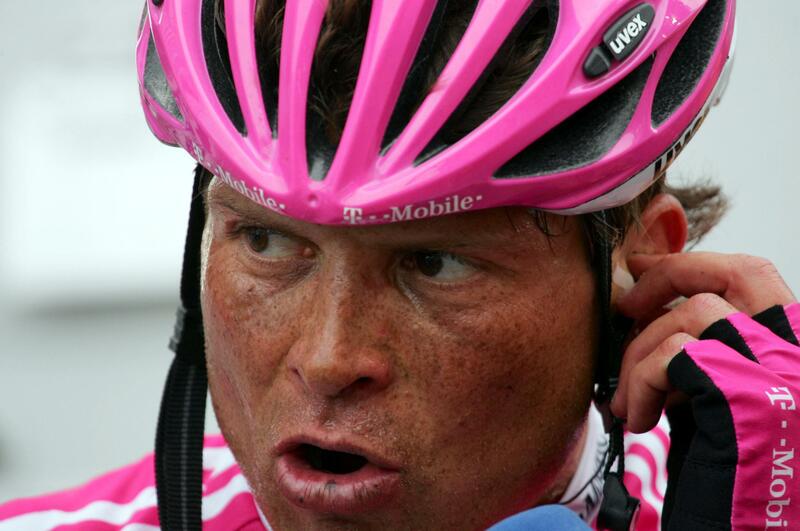 Looks like Jan Ullrich is TT-fit for the Tour de France. T-Mobile's 1997 Tour champion scorched the 50-kilometer (31 mile) time trial course today, finishing in 58:48, for his first race victory since last year's Tour of Germany. Ullrich showed he's got the numerator down on the power-to-weight ratio, and the upcoming mountains should help him shrink his, um, denominator. "To beat Ivan Basso is going to give me a huge morale boost. I knew right from the start that I was going to have a good day. Giro leader Ivan Basso of CSC was 2nd on the day in 59:16, 28 seconds back, but ahead of Italian TT champion Marco Pinotti, at 1:01, T-Mobile's Sergei Honchar, at 1:09, and Paolo Savoldelli, at 1:19. Phonak's José Enrique Gutierrez rounds out the top 6 at 1:42. Damiano Cunego, who was best able to hang with Basso on Sunday's first big climb of the Giro, lost 5:06 (!) to Basso in today's TT, and Gilberto Simoni and Danilo Di Luca did only slightly better. In the GC, Gutierrez remains in 2nd, now 2:48 back, while Savoldelli slips to 3rd behind Honchar at 3:24 and 3:26. Discovery Channel's Tom Danielson is now 5th overall, 5:38 back, with Cunego 8th at 6:54, Simoni 9th at 7:13, and Di Luca 10th at 7:33. Lindsey: Race to Replace has "excellent disaster potential"
Joe Lindsey is afraid that the gimmick casting/reality show that is Discovery Channel's Race to Replace is a bad, bad, idea. In case you've been under a rock, here's the basic idea: Team Discovery needs to find the next Lance Armstrong to lead the team. Contestants will sign up online, and on August 12th, some group of contestants will race at Indianapolis Motor Speedway. The contest winner will line up with the team at the US Pro Championships in Greenville, SC, in September. Details at this time are, as they say, sketchy. Is it mass-start or a time trial? Will there be categories? Is it part of any official USA Cycling program? Will pro racers like Danielson, or even USAC-licensed elite amateurs, be allowed to compete? We don’t know. Here’s what we do know: This has excellent disaster potential. What if the winner's a Fred, and wipes out half the field? What if he's dropped 500 yards into the race? Lindsey thinks the whole thing belittles the long monastic struggle most riders face before they can line up with the elite pros. I'm a little more sanguine about the whole thing. The whole idea still isn't fleshed out, but I'll bet there's no intention for somebody with zero pack racing experience to actually race the full pro championships in September. I'm betting the winner will either a) be part of the U23 team Discovery sponsors (or another national-level amateur), or b) some member of Joe Public. If it's “A”, this is a great chance for the Discovery networks to showcase the talented young racers out there. If it's “B”, I imagine he'll get to ride with the pack through the neutral start, then, with loud cheers and plenty of media attention, be escorted off the course. And it may yet wind up that the contest is only for “team leadership”: The team has promised a series of “webisodes” looking at candidates to replace Armstrong as the leader of Team Discovery starting today. They're pretty much who you would expect: Danielson, Popovych, Hincapie, Ekimov, Rubiera, Savoldelli, and Azevedo. How this “contest” links to the other contest is anybody's guess. In any case, the ads (featuring personalities from Discovery shows) are cute and memorable, any interest in the contest is a plus for US cycling awareness, and the whole project should help maintain Discovery's image as the leading American cycling team. For now, there's this teaser, a free iTunes version of the RtR's TV ad (All the other ads are available free, as well), and “raw footage” from the making of the webisodes here. So what happened to Discovery? Maybe the biggest surprise today was the subpar showing from Discovery, which has been dominant in recent Tour TTTs, and finished 3rd, 39 seconds back, or to make it sound worse, 3 seconds in front of Liquigas. The Paceline's TTT wrapup noted that the team wasn't using aerobars across the board, with only the first 3 riders tucking. Graham Watson points out that Savoldelli wasn't taking many pulls, which he says “hints that the team was saving his legs and energy for a forthcoming stage.” Danielson, on the other hand, was “doing long, long turns on the front of the train, a demonstration imitated by Jason McCartney as well.” Somebody wasn't pulling through, though, because Ekimov got so cooked he was dropped on the finishing straight. My guess, from seeing the web stream and the photographs, is that the team's inexperience in the discipline is what cost them. Neither Danielson nor McCartney had ever done a TTT before. The squad lost most of their time on the front end, dropping 24 seconds in the first 9.7 kms, 9th best. From then on, Discovery was a solid 3rd at each time check. Danielson told VeloNews he had trouble grabbing a wheel after his pulls, and perhaps the team wasn't as coordinated as in past years, when Discovery reportedly practiced the TTT with an eye toward the Tour. And hey -- maybe it was just bad luck. Sean Yates is running the team here, and rode in the Giro's last team time trial in 1989. Near the finish, a black cat ran onto the course, catching Yates's wheel and causing a chain reaction in the 7-Eleven squad. Jan Ullrich's teammate, race leader Sergei Honchar, says the team is focused on July, not May, and that it was all he could do to stay with the squad when Ullrich and Rogers reached full boil: "In the last 5k I was having trouble breathing, they were pulling so hard." Of course, mad TTT skillz won't mean diddly come July -- the Tour won't feature a team time trial this year. Defending Giro champion Paolo Savoldelli of Discovery Channel took today's short time trial in Belgium. Savoldelli was the only rider to covered the 6.2 kilometers in less than 8 minutes. His 7:50 was 11 seconds faster than Française des Jeux's Bradley McGee, and 13 seconds ahead of José Enrigue Gutierrez of Phonak. Among other favorites, Danilo Di Luca was 10th on the day, at 19 seconds, Ivan Basso was at 23 seconds, Cunego was at :25, and Gilberto Simoni was at :26. Paolo Bettini, who had hoped to wear the race leader's jersey after Stage 3, came in at 8:32, so he'll need to take 42 seconds out of Savoldelli. Among Americans, Bobby Julich finished in 8:35, Tom Danielson was in at 8:11, Jason McCartney at 8:21, Phonak's Patrick McCarty, starting his first grand tour, was 93rd in 8:44, and Saunier-Duval's Aaron Olson, likewise starting his first GT, finished in 9:07. Jan Ullrich finished in 8:39 for 80th on the day. 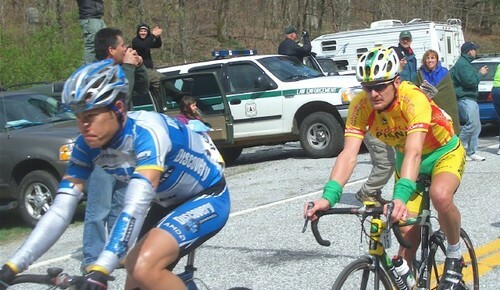 Floyd Landis took another big win on Sunday, finishing safely in the pack to win the 2006 Tour de Georgia. Juan José Haedo, the Toyota-United sprinter who had made two podiums without a win, edged double defending TdG Stage 6 winner Gord Fraser and Phonak's Aurelien Clerc for the stage win. Discovery Channel dominated the race, taking the team classification, the king of the mountains (Jason McCartney), the best young rider (Janez Brajkovic), a yellow jersey (Yaroslav Popovych), two stage wins (Popovych in Rome, Danielson on Brasstown Bald), and the 2nd and 3rd rung of the podium. But the day belonged to Floyd Landis, who dug deep to hang with Danielson and Popovych on Brasstown Bald, protecting his 4-second race lead. He also survived a minor scare on Sunday, when he flatted late during the finishing circuits in Alpharetta, but was able to rejoin the field quickly. 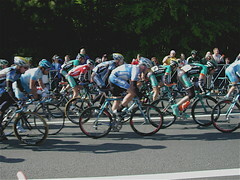 An early 15-man breakaway was slowly reeled in, a few riders at a time, until only HealthNet-Maxxis' Jeff Louder and TIAA-CREF's Will Frischkorn stood between the sprinters and a podium, and Haedo's Toyota-United team and Fast Freddie Rodriguez' Davitamon-Lotto squad did the lion's share of the chasing. I've posted a Flickr photoset of Stage 6. Unbelievable. I'll never doubt Floyd Landis again. Before the stage, I thought there was no way he would be able to last mano a mano with Discovery's Tom Danielson. But that's just what Landis did on the biggest climb in the Tour de Georgia, the 3 mile+ ascent of Brasstown Bald. Discovery's Danielson and Yaroslav Popovych took turns attacking Landis, who marked Danielson and eventually let Popo go. Discovery, realizing that Popovych wasn't going to get enough time to take the race lead, eventually let Danielson attack Popovych to try to finish Landis directly. Landis wasn't cracking. Landis has got to top the short list of American Tour de France contenders, as he looks likely to add the 2006 Tour de Georgia title to the Tour of California and Paris-Nice titles he's already won this season. Check out my Stage 5 Flickr photoset. Neal Rogers offers a preview of this week's race, but predicting (hoping for?) the possibility of an all-US podium featuring defending champion Tom Danielson of Discovery Channel, Phonak's Landis, and CSC's David Zabriskie. Danielson is coming off a new record time in the climb of (the other) Lookout Mountain in Colorado, while Landis has already won the inaugural Tour of California and Paris-Nice this season. Danielson has an eye on next month's Giro d'Italia, while Landis has scrapped the Giro in favor of Tour de France preparation. Rogers also mentions that organizers are planning to recognize Dalton native Saul Raisin during the ride; Stage 4 starts in his hometown on Friday. Crossposted to TdGblog, your source for Tour de Georgia news. The Tour de Georgia has released the official final start list for the six-stage jaunt around Georgia, kicking off Tuesday in Augusta. Last year's overall winner, Tom Danielson of Discovery Channel, returns, supported by Yaroslav Popovych, Viatcheslav Ekimov, new Discos Trent Lowe and Egoi Martinez, Michael Barry, Jason McCartney, and Janez Brajkovic. 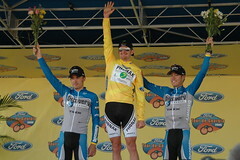 CSC will be headlined by David Zabriskie, Jakob Piil and Brian Vandborg, who won Stage 4 of last year's TdG. Phonak brings Georgia veterans Floyd Landis, who won the time trial last year and took 3rd overall, South African sprinter Robbie Hunter, José Enrique Gutierrez, and Aurélien Clerc. QuickStep is a new addition for the Tour de Georgia, possibly a result of their acquisition by Georgia's Mohawk Industries, but they can't spare Tom Boonen or Paolo Bettini right now. Instead, they'll feature American-Italian Guido Trenti and Davide Bramati. The Tour de Georgia page mentions Robbie McEwen as the headliner for Davitamon-Lotto, but he's not listed on the team roster just below. Daily Peloton shows a different roster, with McEwen instead of Pieter Mertens. McEwen's official website is mum on his upcoming calendar. In either case, “Fast” Freddie Rodriguez and Henk Vogels both are former Tour de Georgia stage winners who will spice things up. Chris Horner is staying in Europe. Prodir-Saunier Duval rounds out the ProTour squads, with Luciano Pagliarini, Marco Pinotti, American Aaron Olson, and Canadian national champion Charles Dionne. HealthNet-Maxxis headlines the 'Continental' teams. Gord Fraser and 2005 TdG sprint jersey winner Greg Henderson are joined by Nathan O'Neill, the only 7-time Aussie time trial champion living in Braselton, Georgia, coming off an overall win at the Tour of Redlands and a Commonwealth Games gold medal already this season. Also in the field is the new Toyota-United Pro team, with Ivan Dominguez, Chris Wherry, former Discovery rider Antonio Cruz, and Juan Jose Haedo. Local favorites Jittery Joe's, out of Athens, Georgia, have added Trent Wilson, formerly of Colombia-Selle Italia. They're also sponsoring a party bus to the top of Brasstown Bald. Ex-Jittery Joe's rider Cesar Grajales, who won the queen stage of the 2004 Tour de Georgia, now rides for Navigators, and will ride here with Ben Brooks and Phil Zajicek, and others. Other Continental squads participating include the Colavita-Sutter Home team, Jelly Belly, Kodakgallery.com-Sierra Nevada, Targetraining, and Team TIAA-CREF, featuring Craig Lewis. Look for 6 ProTour teams in this year's Tour de Georgia, running April 18 - April 23 in my backyard. Team CSC, Discovery Channel, Phonak, and Prodir-Saunier Duval, returning from last year, are joined by Davitamon-Lotto, who will probably bring Chris Horner and Fast Freddy Rodriguez, and Quick Step-Innergetic could bring “American” Guido Trenti; we'll see about Bettini, Boonen, and Milan-San Remo winner Filippo Pozzato. Defending champ Tom Danielson of Discovery and Floyd Landis of Phonak are early commitments. Medalist Sports expects Yaroslav Popovych, Trent Lowe (now with Discovery after winning best young rider at last year's race), and Viatcheslav Ekimov to also appear for Discovery Channel. Full rosters are still a couple of weeks away. Two Pro Continental teams return: HealthNet-Maxxis and Navigators, and 7 UCI Continental teams fill out the field: Colavita-Sutter Home, Jelly Belly, Jittery Joe's-Zero Gravity, Kodakgallery.com-Sierra Nevada, Targetraining, Team TIAA-CREF, and Toyota-United. The Tour de Georgia is just over a month away, and rather than suffering from the addition of the Tour of California to the US racing schedule, my local chance to see the Euro-pros looks to be getting along great. The Macon Telegraph reports Stage 1 is a near-clone of last year's opener from Augusta to Macon, and that Stage 1 will be accompanied by 2 criteriums (sorry, Latin teachers) in downtown Macon (such as it is). Also, Discovery Channel has announced that not only will its team be there, with defending TdG champion Tom Danielson, but that they're helping sponsor the race, the first time they have. They'll be spotlighting a presentation called “The Race to Replace,” looking at how the team is trying to fill the void left by Lance Armstrong's retirement. The Telegraph story says CSC and Phonak will definitely join Discovery on the start line, then lists individual riders they hope to sign, including Liberty Seguros' Alexandre Vinokourov and Quick Step's Tom Boonen. There is even a chance that Lance Armstrong, who retired after winning his seventh Tour de France last summer, may ride in the event. Chris Aronhalt, spokesman for Tour organizer Medalist Sports, said the Tour's ties to the Georgia Cancer Coalition may lure Armstrong back to the bike. This is a great chance to get up close and personal with many of the world's best riders. Y'all come! Discovery Channel's team leaders are already in camp in Solvang, with the balance expected tonight. Hincapie, Danielson, Savoldelli, Ekimov, Popovych and others did some velodrome laps to improve their TT form. Bruyneel also noted that even though last year was Eki’s first time in the wind tunnel ever, the Olympic TT champion was close to dead-on just through his own personal set up. And today bore that out once again; Eki did his first test with his old set up, then after trying a couple of tweaks here and there the numbers said it all – his best run was with his original set up and leave it alone. Sammarye "Velogal" Lewis is on the scene, and trying an interesting experiment: She's audioblogging from Solvang. As usual, she's also got a training camp photo gallery up at SmugMug, including some shots of Michael and Dede Demet Barry's son, Liam. Andrew Hood offers a profile of Discovery Channel's Tom Danielson, not riding this year's Tour but likely to feature on the Disco Vuelta team. Danielson, at 27, is almost certainly the best pure climber among American racers, and got some face time in the press when he won April's Tour de Georgia, largely on the strength of a win in Stage 6, finishing atop Brasstown Bald, the highest peak in Georgia. It's great what people say, but the legs have to do the talking," Danielson said in a recent telephone interview. "You can have the engine to maybe win the Tour some day, but you've got to have the head and the work ethic to make it happen." VeloNews talks to Discovery Channel DS Johan Bruyneel about Discovery's Tour de France prep program and Lance Armstrong's fitness as he prepares to go for Tour win number 7. VN: There was talk that he was a little behind in his form, was that true? JB: It has taken longer to decide the plan. Normally we were in the first of December, we knew already what the calendar would be. This year we waited until the end of January. At the beginning he was definitely behind. He was not good at Paris-Nice, but when he got to the month of May and June, that doesn't count anymore. The training that he was doing; now it seems like it's like all the other years now. Of course, it's not like Johan could even suggest Armstrong's fitness was anything different than the last 6 years. Bruyneel also makes a pre-(pre-pre-)selection for the Discovery Vuelta squad, which he expects to be built around Azevedo, Beltran, Rubiera, Noval, and Danielson. I put together a Flickr photo set of some shots my wife and I took from about 150 meters down the course from the start-finish in Alpharetta. These mostly made me wish we had a better camera; the ITT and Hog Pen Gap pictures both have the riders moving a lot slower, so they're a lot easier to shoot. Velogal has a Stage 6 gallery up, that includes some touching pictures of Andrea Tafi taking a final bow while accepting the overall most aggressive rider jersey, in recognition of long breaks he animated during Stage 2 and Stage 6. And the Atlanta Journal-Constitution has a photo gallery of Stage 6. Judging by the picture HE took, Josh Hallett was about 200 meters down the road from me (although I think I would remember if I had seen the guy in the background without a shirt -- brrrrrr!). There are more shots at Josh's photostream on Flickr. Velogal was there, and got some pictures. Dave Aiello was at the top, and got a great picture of Tom Danielson, Lance Armstrong, and Stage 5 most aggressive rider Christian Vande Velde at the post-race press conference (at right). He's got a running photo gallery covering the whole Tour, which you can also hit by clicking through the pic. Michael at CoolBicycling.com also has a full Stage 5 report with lots of photos. Not technically a blog, but the Atlanta Journal-Constitution has a good photo gallery for the stage, including this cool fisheye shot of Danielson and the crowd near the summit, and they sell reprints of anything on the site. And here's my Stage 5 photoset ot Flickr. Sorry for no "as it happens" updates: I've been out on the course, suffering from an unbelievably cold day for a Georgia April. 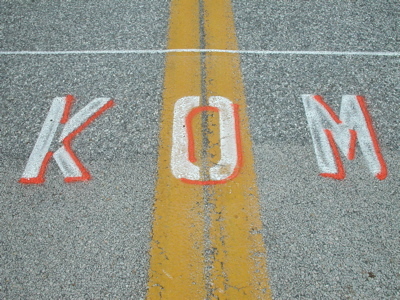 My vantage point: Hog Pen Gap, 17 miles from the finish, at the day's 3rd King of the Mountains line. We saw the very scattered snow flurry, and had a brief bout of sleet, just as the lead group arrived. The crowds were incredible through the mountains; Dave from Operation Gadget said parking was gone for 5 miles approaching the spur road to Brasstown Bald. 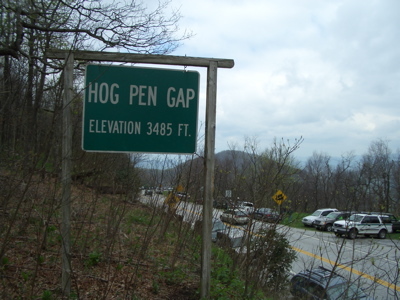 Where I was, at Hog Pen Gap, roadside spaces were gone by around 2, with the riders eventually coming through around 4:30. In Gainesville this morning, Viatcheslav Ekimov predicted that Discovery Channel would take the stage and the overall lead today, but didn't name any names. As the peloton rolled into the mountains, Jittery Joe's rider Tim Johnson took a flyer, and Discovery's Jason McCartney covered the break. The two would ride together over the day's first two climbs, building a lead of almost 2:30 at times. Discovery's José-Luis Rubiera took 3rd over each climb to defend his King of the Mountains jersey. 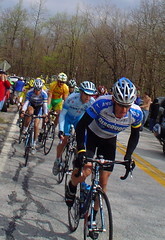 Shortly before reaching Hog Pen, Lance Armstrong launched an attack, and was covered by almost all of the stage and GC hopefuls, including yellow jersey Floyd Landis, Levi Leipheimer, Tom Danielson, Saul Raisin and Trent Lowe (fighting it out for the young rider's jersey), Saunier Duval-Prodir's Nicolas Fritsch and Marco Pinotti, and, by the Hog Pen summit, Bobby Julich and a teammate (picture at right - click for larger). 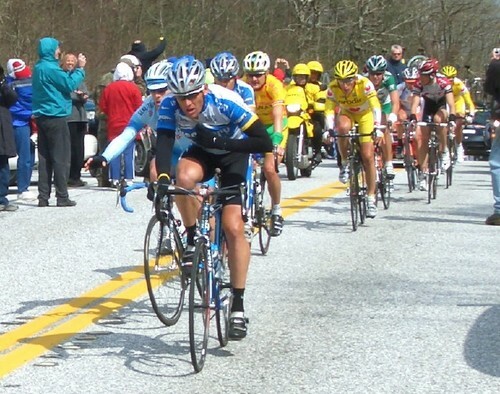 I say "and a teammate," because some sources say it was Andy Schleck, but just after the group passed Hog Pen Gap, Christian Vande Velde launched an attack that he sustained all the way onto Brasstown Bald. Reviewing the tape (wow, TdFblog video), I think it's Vande Velde riding with Julich. On the other hand, a couple of other CSC riders passed by maybe 30 seconds behind Armstrong's group, and could have caught up on the descent. At some point, this became a group of 15, adding Azevedo, Blaudzun, Schleck, Vandborg, Nathan O'Neill, and Justin England (with Vande Velde off the front). Armstrong rode out in pursuit of Vande Velde, with Azevedo, then Danielson and Leipheimer attacked. This put pressure on Floyd Landis, and allowed Armstrong to ride in his slipstream with a teammate up the road. Danielson and Leipheimer rode much of the last 5 kilometers together, slowly gapping Armstrong and Landis. With Leipheimer placed 10 seconds ahead of Danielson on GC, Discovery's Danielson opened up a gap on Leipheimer in the last kilometer. 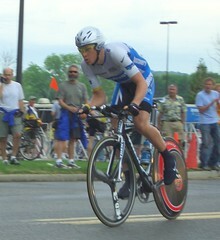 At the finish, Danielson took the lead, with 5 seconds to spare. Back with Landis, Armstrong was finally able to get a split at the summit, and finished 10 seconds clear of Landis, and (Dave Aiello notes) pointing defiantly back down the mountain. 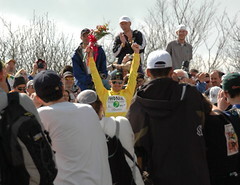 At left, the once and future yellow jersey (click through for larger picture). Lowe holds on to the white (under-23) jersey, while Rubiera will win the King of the Mountains, since there are no KoM points available tomorrow. And, of course, barring a comet crashing into his helmet, it looks like Discovery Channel has a stage on which to introduce Tom Danielson, who is going to win the 2005 Tour de Georgia. Looks like I have to create a "Tom Danielson" category. With all the tough stages out of the way, what have we learned about Lance Armstrong's fitness? Bobby Julich, who clearly targeted his fitness to the early season, lost 43 seconds to the six-timer, which must be encouraging for Armstrong. Was Armstrong going all out on the last climb, or biding his time, helping Danielson gap Landis while Landis marked the wrong Disco? I guess we'll know in July. Also, Levi Leipheimer, ladies and gentlemen; what a gutty ride -- he was also isolated from any teammates for the entire last climb, and put 45 seconds into Armstrong, and almost a minute into Landis. On the other hand, I wouldn't want to spend the night with the CSC's. Christian Vande Velde takes the "consolation prize:" most aggressive rider. They had the numbers in the break, but couldn't get up Brasstown Bald with the Discos, Landis, and Leipheimer. As a result, they'll miss out on the team prize, which they took last year, and Julich will finish in the bitterest position -- one step off the podium. VeloNews wrap-up, with some good Casy Gibson photos. procycling.com | Armstrong: "Danielson's something special"
Today's stage is a near-repeat of last year's Stage 5, rolling from the carpet capital of the world to a Georgia gold-rush town set in the Appalachian foothills. Last year, Jason McCartney, then riding for Health Net, put 53 seconds into the field on a stage with 19,000 feet of climbing and 5 King of the Mountains lines. VeloNews later named his stage the 2004 Ride of the Year, and it helped catapult McCartney onto Team Discovery Channel this year. It's not a mountaintop finish, so the field will have 14 miles to regroup after the last climb of Woody Gap (the peloton climbs it twice today) near Suches. The big question: Is Discovery riding for defending Tour de Georgia champion Lance Armstrong, who lost 1:46 to leader Floyd Landis yesterday, or do they try to break Tom Danielson, placed 42 seconds ahead of Armstrong, and get him some attention as the future of American cycling? Also look for CSC and Phonak to fight it out, with CSC looking to place Bobby Julich and Dave Zabriskie, and Phonak trying to defend Floyd Landis' race lead. Meanwhile Levi Leipheimer sits 50 seconds back, about midway between Landis and Armstrong. This is a team that can climb with anybody. We'll see in a couple of months, but this looks like the core of the 2005 Discovery Tour squad, as well. Missing will be George Hincapie, who lives just a bit up the road from Augusta in Greenville, S.C.
Lance Armstrong will return to action at Paris-Camembert a week from Tuesday. Discovery's other riders will be Jason McCartney, Tom Danielson, José Azevedo, Jose-Luis Rubiera, Fumiyuki Beppu, and Jurgen Van Den Broeck. Tom Danielson to join Discovery? VeloNews quotes Fassa Bortolo sources that US rider Tom Danielson, 26, has opted out of the second year of his contract with the Italian team. Further, they expect Danielson to join Paolo Salvodelli and Yaroslav Popovych as new signings for the Discovery Channel team, the next incarnation of US Postal. Next Tour winner not named Armstrong? Reuters takes a look at the young generation coming of age, and who might eventually win the Tour. Obvious candidates are Andreas Klöden, 29, and Ivan Basso, 26, who rounded out the podium. "My stage win was a clear sign of how I've improved and that I was as strong as Armstrong in the first two weeks of the Tour," said Basso. "I'm only 26 and so I've got time on my side. I'll be able to ride at least eight more Tours and so there's a good chance I win at least one of them." Reuters identifies Voeckler and Sandy Casar as the great French hopes of the moment. Very shy off the bike, Karpets transforms into a powerful all round rider who can climb, time trial and look after himself in the flat stages that are often affected by wind and rain. This year he was 13th overall, more than 25 minutes behind Armstrong but as he matures and improves he will surely move up in the overall standings, perhaps becoming the first Russian rider to win the Tour. And not even at the Tour this year were Giro d'Italia winner Damiano Cuñego of Saeco and Alejandro Valverde of CV-Kelme. Another interesting question is "who will replace Armstrong as the outstanding American rider?" Most Americans in the peloton are within a couple of years of Armstrong's 32, and so on the downhill side of the athletic curve. Leipheimer is 30, Vande Velde and Landis 28, Julich 32, and Hincapie 31. One candidate is 26-year-old Tom Danielson, currently riding for Fassa Bortolo, but left off their Tour squad. He just took 4:10 off Mike Engleman's 12-year-old record in the Mt. Evans Hill Climb, and is prepping for the Vuelta a España. I feel stupid for forgetting Michael Rogers of Quick Step, who had a disappointing Tour at 22nd overall. He demonstrated his time trialing prowess taking 2nd (soon to be 1st) to David Millar at last year's TT world championship. Rogers, writing for BBC Sport, also tips Benjamin Noval of USPS as a rider to watch. 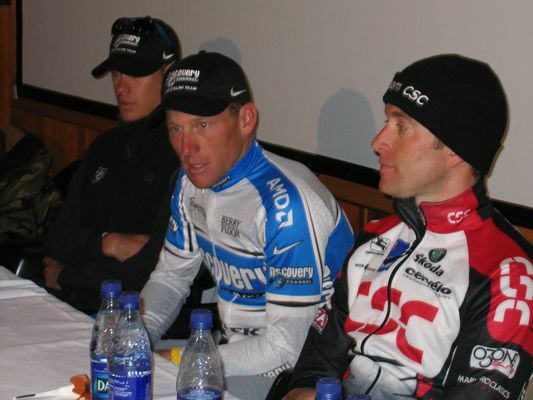 VeloNews offers up a preview of Americans racing in the 2004 European peloton, including team leaders Lance Armstrong of US Postal, Tyler Freaking Hamilton, now with Phonak, and Levi Leipheimer of Rabobank. Newcomers to the Euro scene include Tom Danielson and Tim Johnson, formerly of Saturn, and possibly David Clinger, who raced for Prime Alliance in 2003, after stints with Festina and US Postal.